A visitor plays at the water table at the Children's Discovery Museum in Uptown Normal. How do you create something greater than the sum of those parts? That’s one of the jobs facing Beth Whisman, the new director of Normal’s Cultural Arts department (including the Normal Theater) and Children’s Discovery Museum. 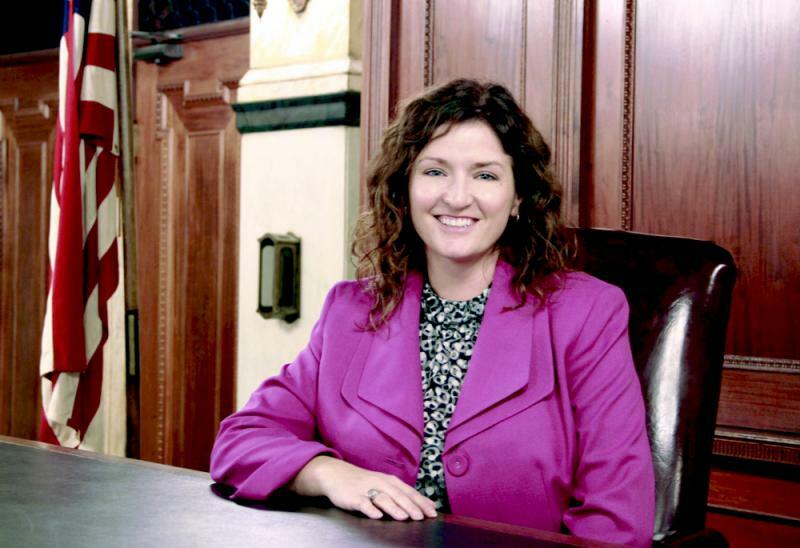 Whisman was hired in February after Shelleigh Birlingmair’s one-year tenure on the job. Whisman, a former broadcaster, previously ran the McLean County Museum of History, where she also served as director of development. Also on Whisman’s plate is an increased emphasis on fundraising—central to the children’s museum’s ability to update exhibits. Beth Whisman is the director of Normal's Cultural Arts department and Children's Discovery Museum. Whisman joined GLT’s Sound Ideas to talk about her new job and her vision for a “holistic” approach to Uptown Normal’s arts programming. The following Q&A has been lightly edited for clarity and length. GLT: What are the goals that City Manager Pam Reece and the Normal Town Council have given you? BW: I came on board after the last director left. And that wasn’t something they were planning on obviously, and I’m not sure (Shelleigh Birlingmair) was planning on it until it happened. So some things were in the middle of transition and planning. So I’m picking up where Shelli left off, which was a really healthy place. She had a strategic plan, looking forward to where the museum was going (in the future). What the town has asked me to do is to take that and think about better development of our (Children’s Discovery Museum) Foundation and our relationship with the organization that raises the money to build our exhibits and improve on our programs. And to flesh out that Cultural Arts department and what it actually means. I’ve been spending a lot of time thinking about holistic approaches to how people spend time Uptown. We have really awesome landmarks and anchors that draw people in, like the Children’s Discovery Museum, the Normal Theater, the roundabout. The direction the town gave me is essentially was, We’re on a good path. We need to stay on this path. But we need to find better ways to seek out revenue, like all municipalities, and how to improve our relationships in the community so that we continue to deliver good educational programs to our schools, home-school students, and our visitors. And think about the vision of where we go in the next 10 years. Where do you see opportunity and need to make physical changes to the museum itself? When the town and foundation partnered up over 13 years ago, the foundation raised over $3 million to build all of the core exhibits. Many of them are still there in the building, which speaks to their high-quality structure because over a million kids have played with those things and they still have a lot of life left in them. When I walk through, I see our newer things, like the My Big Backyard (space), which PNC supported. But next door is a medical exhibit that’s already gone through a couple of changes. Our medical exhibit is now essentially just the south end of that space. Kids love being in there. The dentist chair. The operation table. The skeleton on the bicycle. Those things are really fun, and the kids play with it really hard. It’s one of our original exhibits. And it probably needs the most attention. Luckily, it was really well made, and our Doctors in Concert event has raised money to make repairs, enhance it, and we’ve done that very well. But we’re reaching the point now where we need to think about where that space goes next. It’ll be a medical exhibit, but how is it going to look? How are we going to pay for that? What’s an example of how this more holistic approach to Uptown arts could work? There are partnerships yet to be explored. There are events that can grow. There are probably events we don’t even know about that could come to life in the next few years simply because we’re willing to approach it this way and think about it in this holistic way. There are several examples already. Make Music Normal is probably our most recent example. We do math and music education at the children’s museum. We go into the plaza. We do activities outside to engage people from the museum’s perspective. But we’re also working with the Normal Theater and other venues we essentially create. Other stages. We make that Uptown space this participatory musical experience that also brings in retail and this awareness of this space in our community ad how we can use it very differently. That’s been a huge success and is only going to keep growing. The Normal Town Council and town staff has historically been supportive of the arts. Were that to change in future iterations of the council, or even just in a tough budget environment like the one Normal is now facing, how do you make that case for the value of the arts? My argument for the town and the public is, how we celebrate the things that make us unique, the things that give us something positive or bright in the darkest times—that’s the arts. Whether that’s theater or music or performance dance or art or in learning, that’s important. That’s valuable. We’re not going to ever be the entity that funds the arts, as a community. The town is never going to be that. But it can certainly use its resources to enhance the infrastructure—the Children’s Discovery Museum, the Normal Theater, the Uptown. We have 140,000 people a year who come to the museum. They’re experiencing art and culture when they do that. We have thousands of people who are traveling Route 66 from around the world who are going to land in Uptown Normal, because the town has invested in heritage tourism through the Sprague station. There are economic reasons that make sense. There are philosophical reasons that make sense. And there are holistic, health reasons to invest in these things. This is what makes us Normal. Without these things, we could be Anytown, USA. Do you think Uptown Normal needs another, indoor live performance space? I’d sure love to see that, but I don’t think it’ll come from the public sector. That’s going to have to be driven by the private sector or some serious effort for fundraising. It’s not on my immediate radar by any means. But when you start talking about restaurants and bars and hotels and adding to that larger picture of what Uptown is, a performance space draws crowds. It draws crowds. It draws foot traffic and people and business. I would love to see it. I would love to see a collaborative performance space. There are some opportunities that are out there. As we’re looking at what’s going on with the plaza, what happens with Trail East, what’s happening in the other side of that. Who knows what developers will consider down the road? An excerpt from GLT's interview with Whisman. GLT's full interview with Whisman.